I have 2 reservation forms ( one in dutch and one in english) and the "send request" (in dutch"verstuur") buttons keep disappearing. Now only the dutch version has disappeared ( URL=http://adsonmobilephone.com/?page_id=157) but yesterday both the buttons were gone. When i go to your website and hit "save" they reappear. Can you please tell me what the problem is and how to fix this? Sorry for the inconveniece that may have caused. As I've check your form in your website page I found out that the height of your form iframe is to short for your form. In order to fixed this, all you need to do is edit your form iframe code then change/increase the height from 1187px to 1250px. Where do i edit my iframe code? Because i used that reservation form in a app. If i have to edit the height it in the app i have to rebuild the app and resubmit it to the app stores and thats a lot of work.Is there a way i can change the height of the form in my account on your website? 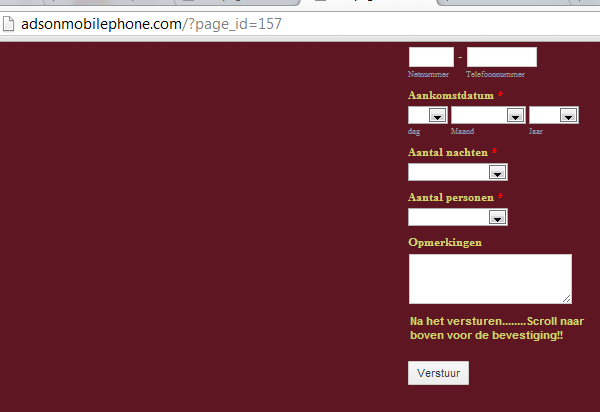 I can now view the submit button on your dutch form here http://adsonmobilephone.com/?page_id=157. 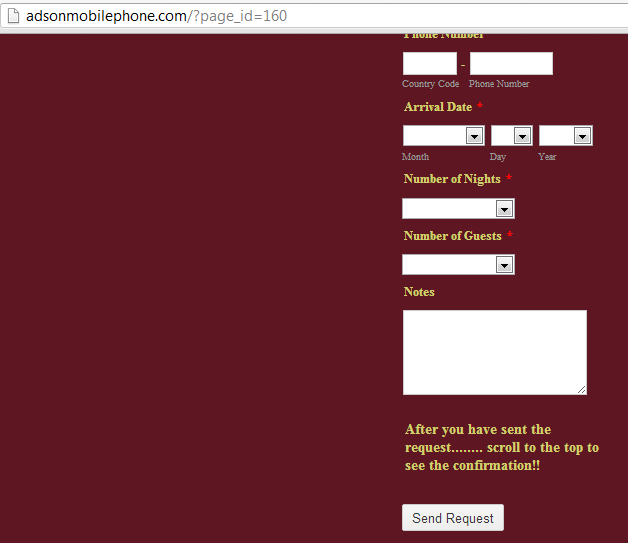 Also, your form is already embedded as iframe. Is this sorted now? Let us know so we can assist you further. That's the problem. It disappears sometimes and when i go to my account it automaticly saves the page without me doing anything, and then the button re-appears. I have checked your form and I don't see any possible settings that would affect the submit button so the problem might be on how the form is embedded on your page as what my colleague have also previously mentioned. Try re-embedding your form using the following code instead. Notice the bolded part, I have increased the iframe height so form will not get cut off. Thanks! Like i said, i use this form in an app and this app is already in the stores, so it will take time and money to re-embed this form. Is there any other way than re-embed my form? smaller font, smaller boxes, less text, etc.etc? Or is re-embedding the only solution to keep the button from disappearing? Yes, changing form question spacing might help. Here's a guide: How can I change spacing between questions? Also, inject the following CSS codes to your form. This reduces the heading space and the text above submit button. I think it's weird when i see that the button has disappeared and i go to my jotform account page of this form, the only thing i do is hit the "save "button ( i am not changing anything else) and the button reappears on my webpage. How come that the button is visible for several days and then disappers without me doing anything? And you told me to solve this to increase the height of the form, but as you can see in the following i frame code i use. The height of the dutch form (with the "button problem") is higher then the hight of the english form ( without any problem!!). I too, can see the buttons on both version of your forms as is. Will you be able to test this on another computer /hardware perhaps? Maybe the issue was on the current unit or sorftware only. If i would go to my account page of this form and only hit "save" without changing anything the form would be ok for a while. Sorry for the inconvenience that may have caused. Can you please try to re-embed your form code then delete browser cache and cookies if that fixed the problem? However, if the said issue still persist do let us know.